If you’ve ever yearned to mash up your cat video with some C-SPAN footage but couldn’t figure out how, today’s your lucky day. Because starting now, YouTube is giving users a choice over how they want to license their content. 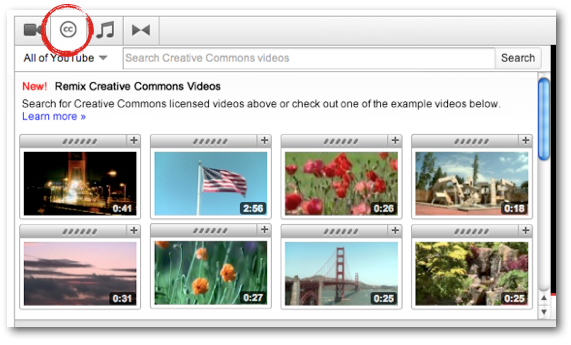 There’s still the standard YouTube license, which is fairly restrictive, and now there’s a new option: Creative Commons (with attribution). In short, you can now give other people permission to use your footage however they’d like, provided to include a link back to the source. Licenses are a tricky business (there are six different Creative Common licenses) but YouTube is hoping to reduce confusion by limiting users to one option, which requires attribution and does allow for content to be used for commercial purposes. So, what does this mean for users? You’ll now be able to use YouTube’s video editor to splice your own video with content that has been uploaded by other users under Creative Commons, and they’ll be able to use your videos if you let them. Which means if your video could really use a shot of a waving flag, or a cat riding a Roomba, you’ll probably be able to add one in just a few clicks. To start things off, YouTube has worked with content partners like C-SPAN and Al Jazeera to offer an initial batch of 10,000 videos under the CC license. That library will rapidly increase as more people switch their content over to Creative Commons, and there’s even a tool that will let you swap the license for a bunch of videos at once. Whenever you watch a video on YouTube that includes CC content that was created by another user, an attribution link will automatically be placed beneath the video. This attribution is currently only shown if you hit the ‘more’ button on the video’s description, but YouTube says it will consider giving attribution links more placement if few people click them.